General Motors has revealed another piece of the $5.4 billion it’s spending on American plants through 2018 to be $1.2 billion for the Fort Wayne, Ind., factory manufacturing the GMC Sierra and Chevrolet Silverado. However, while the automaker offered a few tidbits about painting facility upgrades in a news release Tuesday, it didn’t reveal as much about the “expanded body shop” the money will also buy. We wonder if the change will aid General Motors with major lightweighting changes on the Sierra and Silverado bodies. Other media have reported signs that next-generation versions of the two trucks in 2018 will go the Ford F-150’s aluminum route. Unfortunately for collision repairers eager for details on what GM will do with the popular trucks (and what equipment and training will be needed to repair them), the automaker declined to elaborate any further Wednesday on that topic. “We’re not sharing any details regarding specifics,” GM manufacturing and labor communications manager Bill Grotz said regarding materials handled by the improved body shop, echoing only that GM was “upgrading” the plant’s infrastructure. The work at the plant will take “several years,” GM said in its news release. The automaker will also use the $1.2 billion to build a new electro-coat paint and sealing facility, upgrade and add materials sequencing capabilities and improve the assembly area. 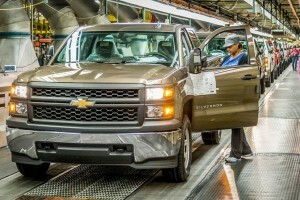 Its truck production schedule won’t be disrupted, GM said.